What It’s About: On Friday, June 13th mild-mannered English professor George Kingsley (Stanley Ridges) is rundown by gangster Red Cannon, himself shot during a gun battle with former associates. Kingsley’s brain is severely damaged, so his friend and fellow professor, Dr. Ernst Sovak (Boris Karloff), transplants part of the wounded gangster’s brain to save Kingsley’s life (and prove his theories in the bargain). Sovak’s motives aren’t entirely pure, however, as Red hid most of his ill-gotten-gains and Sovak hopes that he will be able to get the information out of Kingsley when he recovers. To aid in the process, Sovak takes Kingsley to New York, deliberately bringing him to Red’s old hang-outs in the hopes of awakening Red’s consciousness. Sovak’s theories prove correct and soon Kingsley and Red are doing the Jekyll and Hyde thing, with the main trigger for Red to take over being the sound of sirens. Red uses his new body to gain terrible revenge on his former associates, strangling them one by one, and to see his girl, nightclub singer Sunny Rogers (Anne Nagel). Rogers, disturbed by Kingsley’s intimate knowledge of Red’s affairs, agrees to bait a trap for Red/Kingsley with Eric Marnay (Bela Lugosi), Cannon’s former partner. Marnay does not believe Red is back, but that Red gave Kingsley the location of his loot in return for enacting Red’s revenge. Will Red remain dominant long enough to find the money and defeat Marnay and his thugs? Will Sovak be able to return Kingsley to control and keep him out of jail? Why Watch it Today? : Black Friday begins on Friday, June 13th and is generally considered one of the lesser entries in Universal’s classic horror series. This is both accurate (it’s more of a gangster/revenge picture with some mad science in the shape of a brain graft added in for spice and Karloff is miscast) and unfair. 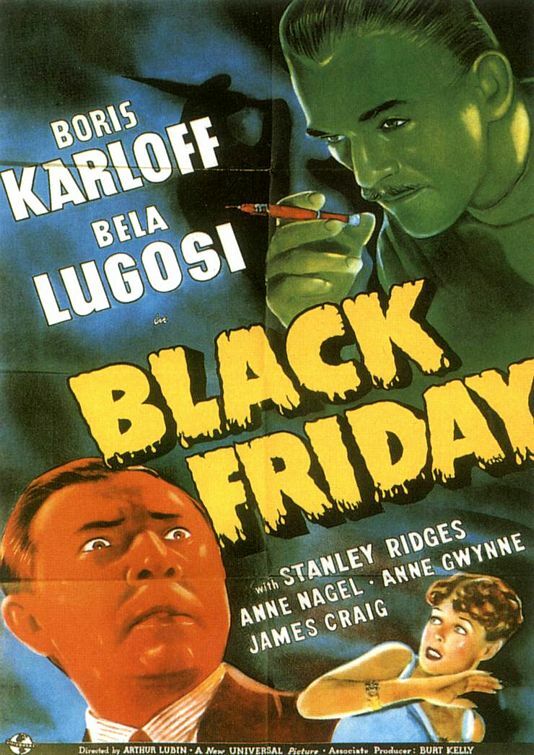 Black Friday‘s odd combination of gangster revenge picture and mad scientist is reminiscent of 1940s radio thrillers, where such combination of crime and weird science were common. Ridges is great in the dual role of professor and vicious gangster, and, if the science doesn’t make any sense, the film delivers plenty of action, murders, and exciting moments (fight choreography fans will particularly enjoy a fist fight in which Ridges seems to be an early proponent of Kirk Fu), all at a brisk pace. Add in Lugosi’s deliriously hammy turn as a gangster and you end up with an oddity well worth watching. You can read our full review here. Other Choices: The first Friday the 13th also takes place on June 13th. This entry was posted in Black and White, Crime, From Beyond the Grave, Gangster, Horror, Lycanthropy/Jekyll and Hyde, Mad Scientist, Movie of the Day, Revenge, Sci-Fi, Thriller and tagged B-Movie, Bela Lugosi, Boris Karloff, brain transplant, Curt Siodmak, Friday the 13th, Judo, Kirk Fu, mobsters, Paul Fix, strangler, Universal Pictures. Yikes. I’ll hold out for Black Sunday instead (either version). Actually, I did see this a few times as a kid, but I recall falling asleep the first two times before I actually saw the whole film. I was getting old before I got old! Zzzzzzzz… wha’d I say again? I don’t think I would like this as a kid, or if I went in expecting a typical Universal horror movie, but I enjoy this one for not being a typical horror movie and something a little off.